The first thing that does give me confidence is the weight of the putter – I do like to let it do the work and not have to smash the ball to get things rolling. I also feel that the grip is the perfect thickness, slightly bigger than what I’m used to but nevertheless just right. The technology itself is easy to work out – I don’t read anything before I take the putter out on the greens. I know most of you are like me when it comes to instruction manuals. They only get a look-in when I’ve nearly broken my new gadget, trying to make it do something. For me technology should be easy to understand. The universal ‘red danger, white go’ seems to be the thing to do and to be fair it works. It does feel a bit awkward at first, making sure that when I look down through the T-shaped putter I don’t have any red showing means I’m lined up and ready to go. 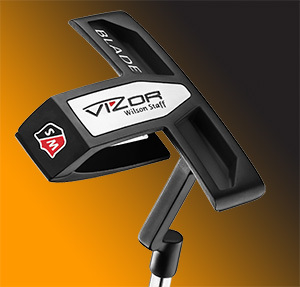 Wilson insist that the Vizor putter can increase your consistency by 20%. Now I am not a bad putter but I can see that the ball is starting on the line I’ve selected. But where it does help me feel a bit more confident is from about nine feet and in. I feel I could be more aggressive with these putts, which is always going to help your confidence. 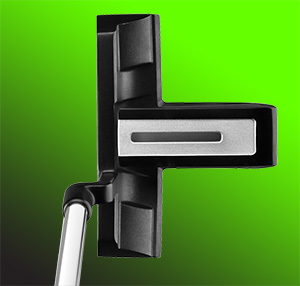 Wilson’s mallet-style putter uses their I-Lock™ technology, designed to avoid poor eye-alignment at address and helps you position your eyes directly over the line of the putt. 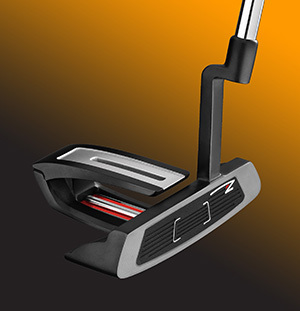 The new technology — which Wilson have nicknamed ‘lock & roll’ — allows you to lock the Vizor putter into position and get your ball rolling on the correct line. A precise cantilever alignment feature locks your eyes directly over the ball. You are made aware of the correct address position when the red bars, which feature on the toe and heel side of the Vizor’s alignment, can no longer be seen when standing over your putt. The Vizor features an aluminium body and a soft urethane face insert, and a stainless steel periphery helps give you a higher MOI (moment of inertia) and extra stability, while the double-bend shaft also helps give you a face-balanced design. To me any putter that makes you feel confident when you step up to your ball on the green is a good putter and Wilson with their technology have given you a putter that will help you get the ball on the line that you’ve chosen. That knowledge inspires confidence especially from nine feet in. Any putter that improves you from that distance has to be admired.